The classic-period Khmer kings ruled over their part-Hindu and part-Buddhist empire from AD 802 for more than five centuries. This period saw the construction of many architectural masterpieces, including the huge capital city of Angkor, with the awe-inspiring Angkor Wat, the world's largest religious structure. Numerous other provincial centers, bound together by an impressive imperial road system, were scattered across the Cambodian Plain, northeast Thailand, southern Laos, and the Delta of southern Vietnam. 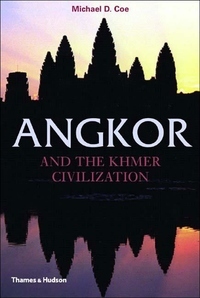 Khmer civilization by no means disappeared with the gradual abandonment of Angkor that began in the fourteenth century, and the book's final chapter describes the conversion of the Khmer to a different kind of Buddhism, the move of the capital downriver to the Phnom Penh area, and the reorientation of the Khmer state to maritime trade Angkor and the Khmer Civilization presents a concise but complete picture of Khmer cultural history from the Stone Age until the establishment of the French Protectorate in 1863, and is lavishly illustrated with maps, plans, drawings, and photographs. Drawing on the latest archaeological research, Michael D. Coe brings to life Angkor's extraordinary society and culture.